Boeing (NYSE: BA) and Norwegian today announced at the 2017 Paris Air Show that the carrier has selected Boeing to provide all its flight training needs. LE BOURGET, France, June 19, 2017 /PRNewswire/ -- Boeing (NYSE: BA) and Norwegian today announced at the 2017 Paris Air Show that the carrier has selected Boeing to provide all its flight training needs. Last year at the 2016 Farnborough International Airshow, Norwegian committed to Global Fleet Care (formerly known as GoldCare) coverage for its 737 MAX fleet and expanded coverage for the airline's entire 787 fleet. These services agreements represented the largest commercial services order in Boeing history. Today's announcement extends this further to now include all its flight training requirements across its Boeing fleet. In July, the work conducted under this contract will reside in Boeing Global Services, a new dedicated services business focused on the needs of global defense, space and commercial customers. Boeing and Norwegian also announced an order for two additional 737 MAX 8s at the 2017 Paris Air Show. Valued at $225 million at current list prices, Norwegian now has 110 unfilled orders for 737 MAX 8s. "By ordering two additional 737 MAX aircraft, we are taking another step towards replacing our current fleet with even more fuel efficient and more environmentally friendly aircraft. This allows us to enhance our operation and reap financial benefits," said CEO of Norwegian, Bjørn Kjos. "Norwegian's strategy is to operate and own the newest state-of-the-art fleet of aircraft, giving passengers high-quality comfort and the shareholders as high a return as possible." 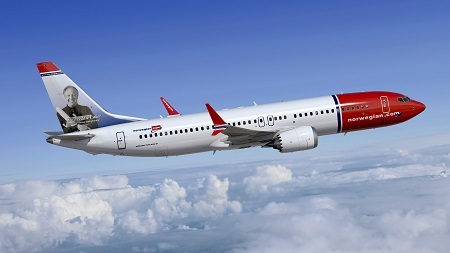 Norwegian is the European launch customer for the 737 MAX and currently operates a fleet of more than 100 Next-Generation 737-800s across its short and medium-haul network. The Oslo-headquartered carrier also operates a combined fleet of more than a dozen 787-8 and 787-9 Dreamliners and has a further 19 unfilled orders for 787-9s. "We are very pleased to provide pilot training to Norwegian with the industry's best flight training as they take a very exciting step in expanding their Boeing fleet," said Stan Deal, president and CEO of Boeing Global Services. "Boeing is committed to giving our customers a competitive edge through services such as Global Fleet Care and our tailored training solutions, so that they can focus on keeping their pilots and airplanes in the air." Norwegian is the sixth largest low-cost carrier in the world and flies over 500 routes to more than 150 destinations in Europe, North Africa, the Middle East, Thailand, the Caribbean and the US.